Ramsey Group may use your Personal Information for the following purposes: to process your orders and administer your account; to administer and improve the Website and related services; to create and maintain user profiles based on browsing or purchasing histories; to notify you of our products, services, promotional events or special offers that may be of interest to you; to provide Internet security; to allow third parties to provide you with information about their products, services, promotional events or special offers that may be of interest to you; or to meet any legal requirements. 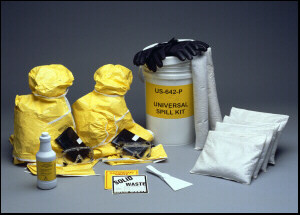 Ramsey Group may supplement information collected on the Website with data from other sources, but this information will not be available online. If Ramsey Group is involved in the sale of a substantial portion of its business assets, Anonymous or Personal Information may be among the transferred assets. Ramsey Group may work with our business partners who may perform certain functions on our behalf, such as fulfilling orders, sending email messages, managing data, processing credit card payments or providing customer service. These business partners have access to your Personal Information only to the extent necessary to perform these specific functions and may not use it for any other purpose. Other than for the specific purposes set forth in this Policy, we will not disclose your Personal Information unless we obtain your prior consent or are legally required to do so. Ramsey Group may use Anonymous Information to update the Website to make it more useful to you and other users. We reserve the right to maintain, update, disclose or otherwise use Anonymous Information, without limitation. Ramsey Group has not designed this Website for, and does not intend for it to be used by, anyone under age 18. Accordingly, this Website should not be used by anyone under age 18. Ramsey Group encourages parents and guardians to be aware of and participate in their children’s online activities. If a person under the age of 18 provides us with his/her data without parental or guardian consent, we encourage the parent or guardian to contact us to have the personal information removed and to unsubscribe the minor from any lists to which he/she may have subscribed. In addition, we strictly adhere to the Children’s Online Privacy Protection Act and will not knowingly collect, use or disclose Personal Information from any child under the age of 13 in any manner that violates this law. When you visit the Website, Ramsey Group or a third-party advertiser may store or recognize some information on your computer in the form of a “cookie” or similar file that can help us in many ways. For example, cookies allow us to tailor the Website to better match your interests and preferences. With most Internet browsers or other software, you can erase cookies from your computer hard drive, block all cookies or receive a warning before a cookie is stored. Please refer to your browser instructions to learn more about these functions. If you reject cookies, functionality of the Website may be limited, and you may not be able to take advantage of many of the Website’s features. The Website may contain links to other sites on the Internet that are owned and operated by third parties. Ramsey Group is not responsible for the collection or use of your Personal or Anonymous Information at any third party sites. We have policies and procedures in place to protect the privacy and confidentiality of your Personal Information that we collect and maintain. All Personal Information is stored on our secured servers, behind a firewall at a data center with access to data strictly controlled. Ramsey Group uses security measures, including: Secure Sockets Layering (SSL) encryption technology for portions of the Website and firewall protection for server hardware security. Neither Ramsey Group nor its affiliate’s guarantees electronic transactions made through the Website. Further, we may change or modify any or all of our internet security policies and procedures at any time for any reason with or without notice to you. Please do not share any online user name or password with anyone, and please update your password at regular intervals. These steps will help to ensure the security of your Personal Information. Any unauthorized use of the Website may result in criminal and/or civil prosecution. Email communication to and from our Website is not secure unless clearly noted otherwise. This is a risk inherent in the use of email. Please be aware of this when requesting information or sending information to us by email. When working with our internal database created from online opt-in activity on the Website, we employ industry standard encryption technologies to help protect consumer data. You may access and update your own Personal Information in your online profile by logging onto your account and clicking on the “View Account Profile” link on the left side of the screen. You are required to maintain currently accurate personal information on the Website. We may disclose information when required by law and when we believe that disclosure is necessary to protect our rights and/or comply with a judicial proceeding, court order, or legal process. We may monitor and, when we believe in good faith that disclosure is required, disclose information to protect the security, property, assets and/or rights of Ramsey Group from unauthorized use, or misuse, of the Website or anything found at the Website, and you authorize us to disclose such information as we believe, in our sole discretion, is necessary or appropriate. If you have any questions or comments about this Policy or wish to be removed from the Ramsey Group database, please contact us using our website contact form. Please provide a concise communication with complete information, including your contact information. We are committed to fairly resolving all disputes and to only using your Personal Information as described in this policy. 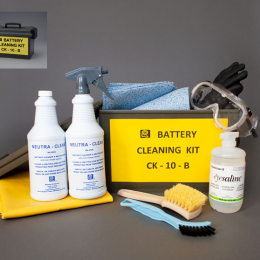 Self contained kit packaged in non-corrosive tool box contains appropriate personal safety wear and tools to safely and effectively neutralize and clean batteries.